Do You Have a Middle Schooler Who Loves Basketball? 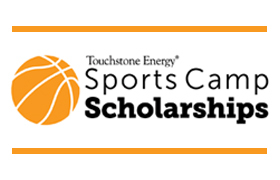 If your child wants to gain experience training alongside real college basketball players and coaches, apply for a Touchstone Energy Sports Camp Scholarship and attend basketball camp for free this summer! Jones-Onslow EMC is now accepting applications for full scholarships to renowned basketball camps at two North Carolina universities this summer. Young men can apply for a scholarship to attend the Roy Williams Basketball Camp June 22-26 at the University of North Carolina at Chapel Hill, and young women can apply for a spot at the Wolfpack Women’s Basketball Camp June 9-12 held at North Carolina State University in Raleigh. To apply, students must be a rising sixth, seventh or eighth grader. Applications and more information have been sent to all public middle schools in the JOEMC service area. Applicants will be judged on their academics, extracurricular activities and an essay. The application deadline is March 31.